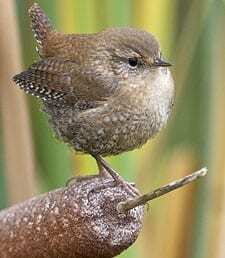 A plain brown bird with an effervescent voice, the House Wren is a common backyard bird over nearly the entire Western Hemisphere. Listen for its rush-and-jumble song in summer and you’ll find this species zipping through shrubs and low tree branches, snatching at insects. House Wrens will gladly use nestboxes, or you may find their twig-filled nests in old cans, boots, or boxes lying around in your garage.